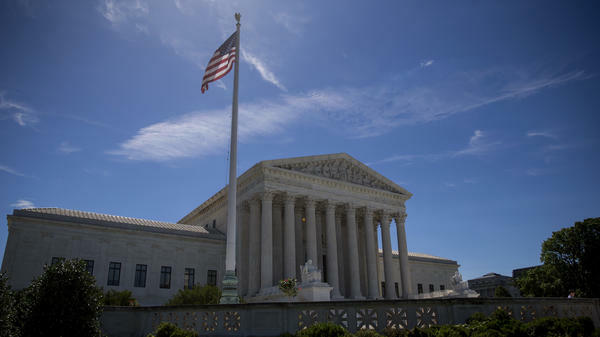 The U.S. Supreme Court has been asked to intervene in pending cases about the legality of the Trump administration's decision to end the DACA program. The Department of Justice has once again petitioned the Supreme Court to intervene in pending cases over the future of DACA, or Deferred Action for Childhood Arrivals, the Obama-era program that protects immigrants who were brought to the U.S. illegally as children. The program is keeping about 700,000 young people from being deported, NPR's Joel Rose notes. At the moment, DACA is accepting renewals but not new applicants. If the program is ended, currently protected individuals could be deported, though it's not clear how quickly that might happen. More than a year ago, the Trump administration announced it was ending the program. Multiple judges have blocked that change, and three cases have worked their way to the federal appellate level. But the Trump administration is asking the Supreme Court to skip ahead in the process — and step in before the lower courts are finished. In a filing dated Tuesday, the department said that allowing the cases to continue to move through the normal appeals process would cause an "untenable and unnecessary" delay in the administration's efforts to eliminate the policy. This is not the first time the federal government has made this request. In early January, after a federal judge in California blocked the administration's plans, the Justice Department sought direct review from the Supreme Court. In a statement, the department called that a "rare step." But the Supreme Court denied that request. The court said it believed the lower court "will proceed expeditiously to decide this case." Ten months later, the Justice Department says that isn't happening, arguing that without intervention from the Supreme Court now, "there is little chance the Court would resolve this dispute for at least another year," the department argues. The sticking point is a lawsuit filed by the Regents of the University of California, the university system's governing board. The case is currently before the 9th U.S. Circuit Court of Appeals, which is widely viewed as a liberal-leaning court. Oral arguments were held in May, and a decision has not been issued. In that case — like in the other lawsuits over this issue — challengers say that the White House acted "capriciously and arbitrarily" in ending DACA. Instead of providing a policy explanation for withdrawing DACA, the Trump administration claims that the program was always illegal. The Justice Department maintains that position and has vigorously defended the president's authority to end DACA. "The last administration started DACA without a mandate or even an authorization from Congress or the courts; this administration can therefore end DACA at any time," Attorney General Jeff Sessions said in a statement Monday. "That is what we have done, and it was the lawful thing to do." Jeffrey Davidson, an attorney representing the Regents of the University of California, said in a statement that the case should "be reviewed in the ordinary course." "This is the second time the Trump administration has attempted to shortcut the normal appellate process by seeking Supreme Court review prior to any decision by the Courts of Appeals," Davidson said. "The irregularity of the government's procedural choices mirrors the irregularity of the government's rescission of DACA itself." Meanwhile, it's worth noting that the status of DACA recipients also could be resolved through an act of Congress — but in recent years, Congress has had a notoriously difficult time taking action on immigration issues. The state of Texas will continue to incur irreparable financial harm if an Obama-era immigration program isn't halted immediately, attorneys for the state argued in Houston on Wednesday. South Texas is ground zero for a fight to end DACA, the Deferred Action for Childhood Arrivals program. The Trump administration has tried to end it, but twice, courts have ruled that the administration can’t do that. Now DACA opponents are trying a different legal maneuver – Texas and six other states have sued the federal government. The Trump Justice Department’s not putting up a fight, which could mean the end of DACA. Texas Attorney General Ken Paxton has asked a court to stop the federal government from issuing or renewing DACA permits while a lawsuit Texas filed yesterday with six other states is pending.